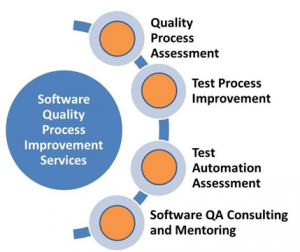 IQMS Software process improvement training is a way to develop the business excellence. As process quality can be determined by Process-specific metrics and Process Maturity. A good process framework helps improve business performance through increased productivity and reduced cycle times and helps deliver high quality products. IQMS Software process improvement training offers customer a complete range of process improvement related solutions that covers the best of process/quality models and applied proven methodology and practices. Software Process improvement training facilitates organizations to move to new levels of business excellence through incremental process improvements that are either benchmarked against established models (ISO/CMMI/Six Sigma) or focused on specific process areas of improvement. Incremental and breakthrough process improvements have been achieved through our Six Sigma training. To create high-quality software on time and within budget, it is important to go through a series of predictable steps, which are like a road map. IQMS provides a road map is called a software process. These software processes form the harness for the technical methods used to build software and are essential for project planning and execution. They are defined to meet certain objectives, such as product quality or ability to meet a schedule. IQMS Software process improvement training is an ongoing activity that helps to continuously improve the quality of software built by an organization. Various process improvement and process assessment models are available for evaluating and improving processes. Predictability. With experience and measurements, organizations have improved their estimation of schedule and budget through time. Quality. Program defects decrease as productivity increase. Customer confidence. The establishment of processes gave customers security in terms of having its projects managed professionally and not being dependent on heroes as its applications scale. Better employee morale. Employees gain higher morale in the process as they are much guided in their work through policies, training programs, and well-documented plans. IQMS Software process improvement training usually takes place with the intent of not only making things better but help in achieving basic business goals or objectives today. Rather than being people or technology focused, organizations are encouraged to be process-focused in its software development methodology.